The first object which greets you as you enter the beautiful Italian Embassy in Cairo is a headless Graeco-Roman marble statue. A small accompanying plaque explains it was a gift from Nino and Aldo Olivetti in memory of their grandfather Aldo Ambron. Having admired this exquisite piece of second century AD sculpture you walk off wondering to yourself who was this Mr. Ambron and what other works of art belonged in his collection. The answers used to be in Alexandria. Peering through a tall rusty iron gate past the overgrowth which surrounds Nos. 17/19 Maa'moun Street (ex-Babour al-Talg) in Alexandria's Moharam Bey district, you can glimpse an old dwelling suffering from terminal consumption. "The perfect exterior for Miss Favisham's home" would have been Cheekie's comment. An unpublished poet and avid reader, Great Expectations would have certainly featured in her stepfather's famous library at Villa Ambron before it became Lawrence Durrell's wartime address. Born Vera Rabinovich, "Cheekie" Bajocchi, 88, carries with her special memories of Villa Ambron. Not only did she spend part of her childhood there but it is in one of its gilded bedrooms that her mother gave birth to Vera's half-sister Charlotte Debanne in the presence of her anxious step-father Max. It is also there that her family suddenly plunged in mourning when her mother died unexpectedly in August of 1920. Max and Nelly represented Durrell's Alexandria, a cosmopolitan hodgepodge of ethnic mixtures where education and savoir faire were the bonding elements amongst the city's upper class. Max was the issue of a confluence of wealthy Hellenistic Syro-Levantine families including the Bacos and Zoghebs. Nelly, his petite vivacious wife, was also a complicated mixture. Her mother Rachel Cattaui was related to Egypt's top drawer Jews and her father was the son of Elia Rossi Bey, the Ferrara-born physician of the khedivial family. Before she became Madame Debbane, Nelly was married to Alexis Rabinovich, a doctor from Odessa who came to Egypt in 1907 for health reasons. Shortly after Vera and Sacha were born the Russian medic converted to Islam earning him the sobriquet of "al-dactor Ali" of Villa Gabalaya, Helwan. The marriage broke up however and Doctor Rabinovich ended in a Paris sanitarium where he died abandoned by his family. None, it seems, had taken kindly to his conversion..
For several years Max, Nelly, Vera and Sacha, plus their dog Popsy and Gotta the cat, occupied Villa Ambron's second floor. According to Cheekie, the house was so big that the Ambrons partitioned it in two leasing out the upper floor which had a quaint tower and a flagpole. "Before we moved in a British couple and their son, Donald Ross, lived on the second floor" recalls Cheekie adding excitedly how the villa had been inhabited by a friendly ghost nicknamed Donald. "He often played with me and my younger sister. He would open doors and knock on the brass beds." The ephemeral companion would also suddenly appear at the sisters' window. Ghosts indeed, yet when it was the turn for consul Signor Impallomeni to replace the Debbanes at Villa Ambron, Donald was still around much to the consternation of the Italian diplomat and his wife. Cheekie also recalls how the Ambrons were away during most of her family's tenancy. Aldo Ambron, an Italian Jew, was a slim intelligent looking man, his mustache making him look older and darker than he actually was. Mrs. Ambron, born Amelia Almagia, was nowhere to be seen. Of their two daughters, Gilda (pronounced Jilda) was the artist and Nora the musician. Emilio, the Ambron's only son, indulged in etchings. Cheekie vividly remembers one of his works depicting the Sphinx. A civil engineer, Aldo Ambron headed the Societe Egyptienne d'Entreprises Urbaines et Rurales which built apartment and commercial buildings in downtown Alexandria. Ambron's fellow directors were the captains and kings of Alexandria's thriving business community. Edouard Karam was in real estate, insurance and transport; Jacques Aghion was in railways and sugar; Alfred and Jacques Suares were bankers; Raphael Toriel was in cotton; and Grisane Vannuci, oil. Ambron chose his partners well. An art connoisseur he partnered with Prince Youssef Kamal to found La Societe des Amis de l'Art. One of the advantages of the Ambrons frequent absence meant that Cheekie and Sacha could play in the beautiful garden amongst the Greco-Roman marble statues, ancient granite columns and large banyan trees. "Watching us was Miss Jeffries our Welsh governess who later became headmistress of a girls school in Heliopolis." According to Cheekie her parents made good use of the garden during the summers entertaining Alexandria's best. Cheekie even admits to a girlish crush on one of the younger French guests. Years later Monsieur de Witasse would become France's minister plenipotentiary to Egypt. The Ambron garden was divided into three parts and constantly in flower. Ginger lilies, capucines (abu khangar) frangipani trees and violets blossomed in turn. And at the far end, beyond the unused tennis court and the Italian wrought iron well, stood the gardener's shed. Somewhere in the middle was the miniature Noah's arc display which so fascinated Vera and Sacha and seemingly the next door neighbor's children. "From their upstairs window the Emilio Levi children would stare longingly at the interesting garden. On the other side of Levi's house stood the Edith Cavell hospital for mental disease. Far less interesting!" Max Debbane painted and refurbished certain areas of Villa Ambron making special allowances for Alexandria's finest library part of which would be acquired many decades later (1993) by AUC's Rare Books Library. "Outside my step-father's library just as you entered the yellow dining room stood the grand piano half covered by my mother's Spanish shawl." Cheekie was barely eleven when her mother died. This was also when Max Debbane went into deep depression retiring in the room below the tower draping it entirely in black. Villa Ambron felt suddenly very cold and empty. It was time to change scenery. Years later, when visiting her Alexandrine friend Nadine Tilche (Mrs. Carlo "Jo" Suares) Cheekie learned the Ambrons had moved into a new house by the sea in Saba Pasha not far from Borschgrevink Street. The old house in Moharam Bey did not remain empty for WW2 was looming and Villa Ambron was about to receive a new set of very interesting tenants. Your correspondent Zoe d'Ay of Queensland asks what happened at the Villa Ambron after the death of Nelly and the departure of Max Debbane. In fact Aldo Ambron, his wife Amelia and their daughter Gilda lived there throughout the Second World War. 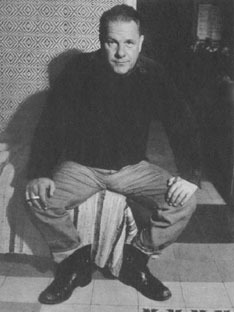 They occupied the ground floor and let out the upper floor to Lawrence Durrell, who was British Information Officer in Alexandria, and to a number of his friends, most of whom were working for the British Council. As it happens the one Alexandrian who is mentioned by her real name in Durrell's Alexandria Quartet is Gilda Ambron -- she died soon after the war, and Durrell specially added her name to his manuscript by hand as a tribute to her and to her family. More about the years Durrell lived at the Villa Ambron, and his relationship with Gilda and the Ambron family can be gleaned from Alexandria: City of Memory by Michael Haag (ie me) to be published in September 2004 by Yale University Press, London and New Haven, and The American University in Cairo Press. I last visited the Villa Ambron in October 2003. Developers had built ugly blocks of flats in the garden. The law forbids them to tear down the villa, but by neglecting it, knocking down its interior walls, and so forth, they have brought it near to collapse, and I do not expect that it will survive many months into this year. The same is true of the artists' studio behind the house where Amelia and Gilda once painted, along with their friend Clea Badaro, who was the model for Clea in Durrell's Quartet. The charm and history of Alexandria are being ruthlessly destroyed. I was enchanted to read of the rise and fall of the Villa Ambron in 2 articles sent me by John Burgess. I live in Australia (in tropical north Queensland) and went to my first Durrell Conference last year, in Corfu. Were you there also? I really don't have anything scintillating to say other than to tell you how much I enjoyed your article - but what happened next? That is, during the War and up to the current time? It makes me want to rescue Villa Ambron and create a time capsule to match its heyday! I am sure the world needs it. So this comes with all good wishes.